Tony Conrad has significantly influenced cultural developments from minimalism to underground film, "concept art," postmodern appropriation, and the most sophisticated rock and roll. Creator of the "structural" film, The Flicker, collaborator on Jack Smith's Flaming Creatures and Normal Love, follower of Henry Flynt's radical anti-art, member of the Theatre of Eternal Music and the first incarnation of The Velvet Underground, and early associate of Mike Kelley, Tony Oursler, and Cindy Sherman, Conrad has eluded canonic histories. Yet Beyond the Dream Syndicate does not claim Conrad as a major but under-recognized figure. Neither monograph nor social history, the book takes Conrad's collaborative interactions as a guiding thread by which to investigate the contiguous networks and discursive interconnections in 1960s art. Such an approach simultaneously illuminates and estranges current understandings of the period, redrawing the map across medium and stylistic boundaries to reveal a constitutive hybridization at the base of the decade's artistic development. This exploration of Conrad and his milieu goes beyond the presentation of a relatively overlooked oeuvre to chart multiple, contestatory regimes of power simultaneously in play during the pivotal moment of the 1960s. From the sovereign authority invoked by Young's music, to the "paranoiac" politics of Flynt, to the immanent control modeled by Conrad's films, each avant-garde project examined reveals an investment within a particular structure of power and resistance, providing a glimpse into the diversity of the artistic and political stakes that continue to define our time. "Branden Joseph has emerged as one of our most accomplished and significant cultural historians. Ranging across film, music, and art, his new book focuses on the myriad accomplishments of Tony Conrad. The combination of its detailed scholarship across a very wide cultural field, the incisiveness of its analyses, and its ease in moving dialectically from the most precise formal details of works of art to their general social and political implications is remarkable. Overall his demonstration of the interrelatedness of different cultural spheres presents a radical challenge to the hermeticism of orthodox art history and to the simple-minded high/low binaries of affirmative cultural studies. It's hard to imagine, let alone find, a work in sixties' cultural historiography of comparably broad insight and originality." 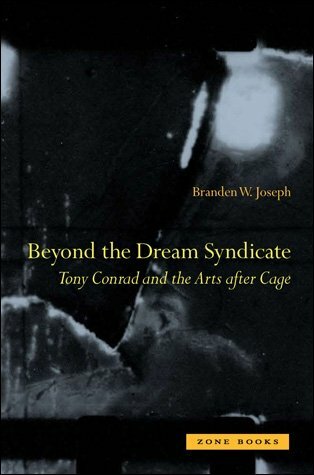 "Beyond the Dream Syndicate is Branden W. Joseph's admirable step outside the art historian's typically crisp disciplinary boundaries. Joseph's gambit is to use the brilliant, improbable Tony Conrad as his guide through one generation's challenge to make art after John Cage. In the course of this expedition, we encounter rigorous meditations on minimalist music and visual art, Henry Flynt's Concept Art, daily life with Jack Smith, the hilarious head-on collisions that resulted in the Primitives and the Velvet Underground, and the stroboscopic consequences of Conrad's 1966 film The Flicker. This is a highly original, rewarding book, and one that will catch people by surprise. I imagine that this is a book for which many people have unconsciously been waiting." "Pivoting on Tony Conrad's seminal role as artist and theorist, this groundbreaking book reexamines the post-Cagean milieu of early sixties New York where visual art, music, film, and performance increasingly overlapped and hybridized. Richly detailed, scrupulously researched, Joseph's brilliant analysis deploys a Foucauldian model to reformulate crucial questions of artistic authorship, tease out the political and social implications of Conrad's prescient production and interactions with his peers, and reconfigure a broad swathe of American vanguard culture so that the imbrication of these artists' practices in structures of power stands newly revealed."